‘Multiple’ Losing Streak Probability Cal – Pt1. 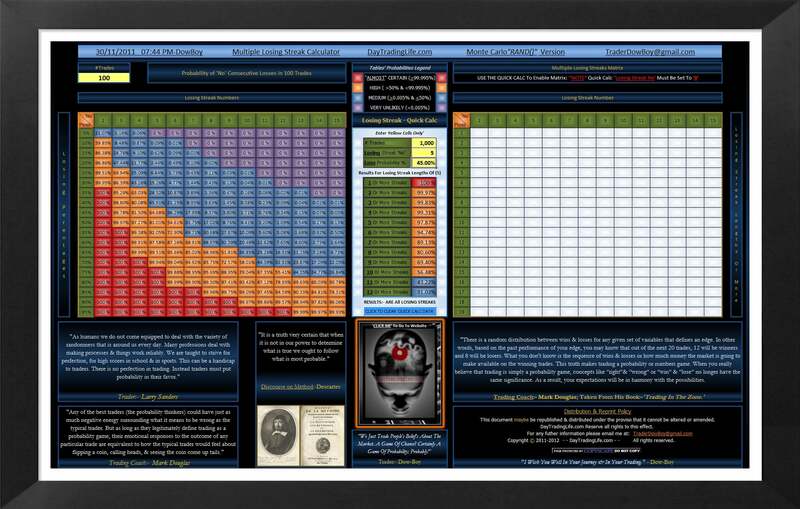 It is extremely important to note that one uses this ‘Losing Streak Probability Calculator’ within a conjecture of a ‘Super Trader’s State of Mind.’ A state of mind that is completely aligned & seamlessly congruent by his Beliefs, his Vision, whilst utilising considerable Feedback. 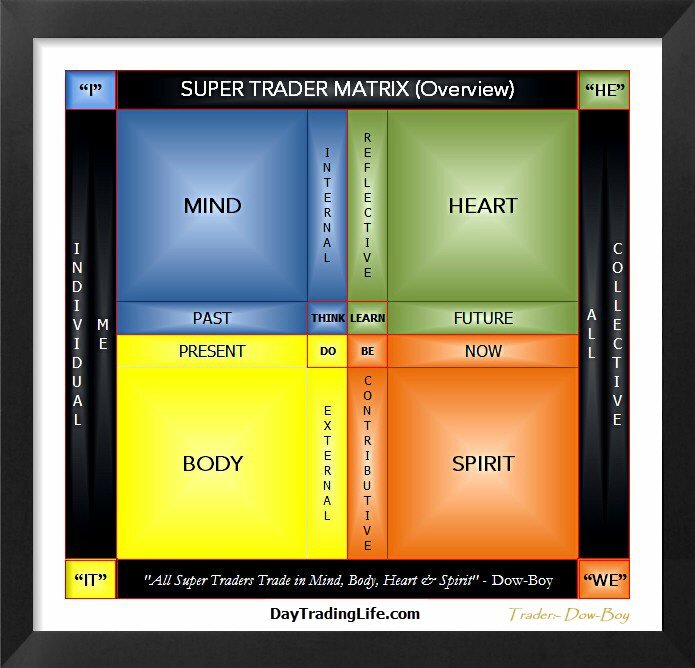 “A Super Trader thinks feels & acts within the realms of PROBABILITIES.” Dow-Boy. 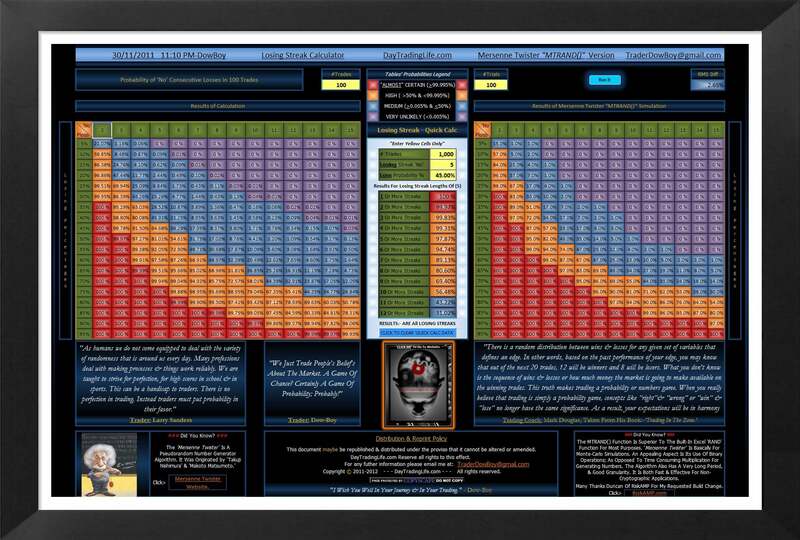 “Multiple Losing Streak Probability Calculator.” Focus On the P Not The L! My quest in the creation of this calculator was driven by two things. A lack of accurate reliable data on the WWW. regarding ‘Consecutive Losing Streaks’. My Bias towards ‘Right Sided Brain Function’, Creativity! I do enjoy the creative process. The WWW. Lead me into various trading forums, websites & blogs which culminated in frustration in many ways. I won’t elaborate. I had to seek help & ‘custom build’ in order to create a ‘Losing Streak Probability Calculator’ that would provide accurate results. 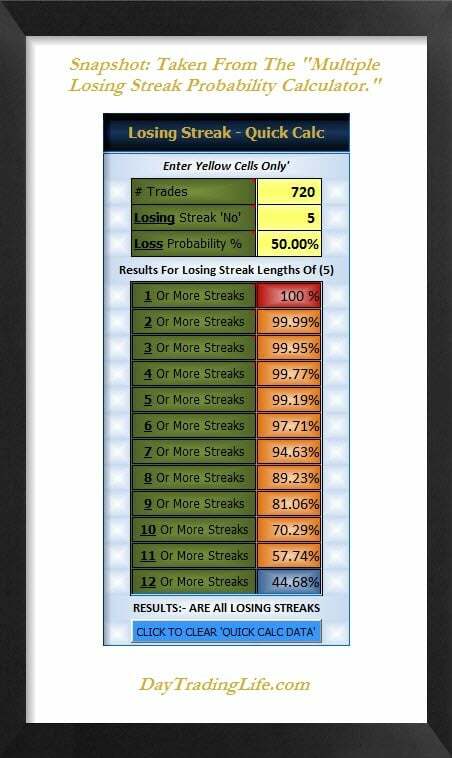 So, with the help of some very clever coders I was able to bring my idea to life & co-create a spreadsheet for traders relating to losing streak probabilities. I asked one of the coders ‘BruceZ’ if he could (in a not too technical manner) describe how the implementation of his VB code worked within the dynamics of this spreadsheet. I asked this for two reasons. To give you a broader understanding regarding the ‘Under The Hood‘ dynamics of its programming. Via this higher level of comprehension you can benefit & maximise your utilization of this Losing Streak Probability Spreadsheet. CONFIDENCE. Confidence is the highest order belief within a Super Traders psychological makeup. It’s only with confidence that one can truly overcome fear. 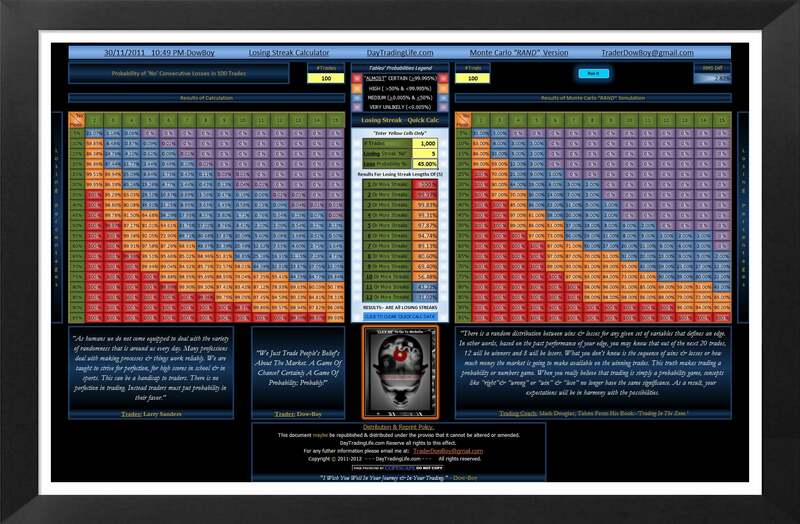 By increasing your knowledge, you increase your faith & confidence in its function & the accuracy of the data that this Multiple Losing Streak Probability Calculator returns; you will in turn have CONFIDENCE to make any necessary changes to your trading system you see fit; having 100% confidence in the calculators returned results. Two functions were written in Visual Basic which work with the Excel spreadsheet to compute the exact probabilities of runs of consecutive losses. 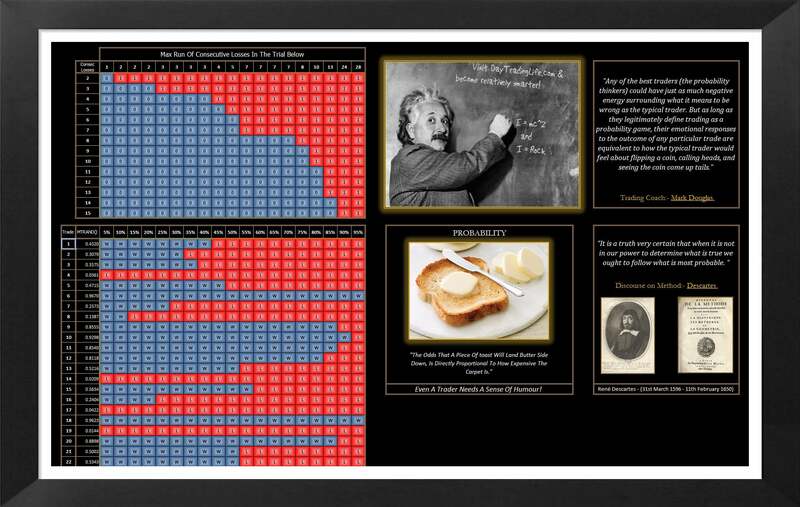 The first, called ProbRun, computes the probability of 1 or more runs of consecutive losses in a given number of trades for a given probability of a loss. This is computed by a recursive difference equation given in the code comments. For each trade, the previously computed probability that a run occurred by the previous trade is added to the probability that a run ended on the current trade multiplied by the probability that no run has occurred earlier. The second function, called ProbRunMulti, works with the Quick Calc & is used for the matrix to compute the probabilities of multiple runs of consecutive losses within a given number of trades, where each run is separated by 1 or more wins. This also works by a recursive difference equation given in the code comments. In this case, for each trade, the previously computed probability that a given number j or more multiple runs occurred by the previous trade is added to the probability that a run ended on the given trade multiplied by the probability that an exact number j-1 of runs has occurred previously. This final probability is computed by subtracting the probability that j or more runs occurred previously from the probability that j-1 or more runs occurred previously. This requires retaining 2 sets of values for j or more runs, and for j-1 or more runs. The first routine, ProbRun, conserves memory by implementing a circular array. This means that the amount of memory used does not depend on the number of trades. Instead, the array size will be equal to the run length plus 1, and the number of bytes will be 8 times this since double precision is used. So for a run length of 15, this array will use just 128 bytes. you can find additional comments within the VB code of all the spreadsheets. Hypothetically; one of your day trading strategies generates an entry signal approximately 3 times a day, which equates to 720 trades per trading year (3×5(Mon-Fri) x48 (Trading Weeks A year, Allowing for weekends & Holidays). This strategy has a win rate of 50%. Question 1: “What is your statistical probability that within this 720(n) Trade run that your system will generate 5 consecutive losing trades in a row? Question 2: “What is the statistical probability that it will also generate 2,3, or even ‘4 or more’ consecutive losing streaks of 5 trades all within this same (n) trade series length? IMPORTANT: Learn HOW To Question! To get the most out of these spreadsheets you need to understand what questions to ask, & why you are asking them, in other words; “HOW to question.” These spreadsheets return accurate valuable data, a perfect characterisation of the ‘Pareto Principle.’ 90% of their power lies buried within the context & quality of how one questions the data! [Internally : MIND] & [Externally : BODY]. So, maybe we should question “Why? Why would I want to know?” “Why am I generating 5 losing streaks more frequently than I should be statistically?” This again isn’t the best question to ask. To just delve a little deeper here, as this is important & is ingrained deep within the psychological thinking of ALL Super Traders. “Why?” Why is very much associated with a negative attitude & a complaint riddled mindset. “Why did I get stopped out?” “Why did I not follow my rules?” “Why did I sell too soon?” These types of questions indicate a level of thinking that initiate & create a negatively charged neural net; which aid in nurturing damaging & destructive emotional responses. If you don’t question this way already; then do take this on-board earnestly. It’s hugely significant; a paradigm shift with vast implications. Asking “HOW?” IS questioning at a higher level than the problem. All Super Traders are happy, content & grateful individuals. Again; Please take in the above seriously. It really is a huge key to your success as a trader & in living a truly fulfilling life. How you speak to yourself [INTERNAL : MIND], the words you use & HOW You Question & evaluate everything will determine your results. Again, it’s in HOW you question & evaluate. It’s not in how one OBSERVES things; it’s in HOW you PARTICIPATE with these spreadsheets that will determine what types of results & answers you will receive from this creative process. What kinds of questions you should be asking. Several examples & different scenarios. I hope you enjoy using these very useful ‘Losing Probability Spreadsheets’ as much as I’ve enjoyed being a part in their creation. Many thanks again to: SHG, BruceZ & Duncan Werner for all their help & their contributions in the making of these spreadsheets. Without their help, these sheets would not be here now. 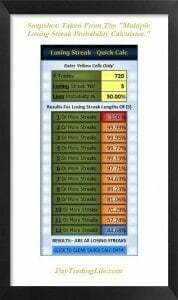 how do you calculate with the excel’s You provided, the probability of consecutive multiple streaks? That is, probability to have for example 5 consecutive streaks of 3 losses in 100 trials ? I think the calculators only calculate the probability of multiple streaks but not consecutive, am i right? They are spreadsheets for “CONSECUTIVE” losing streaks. 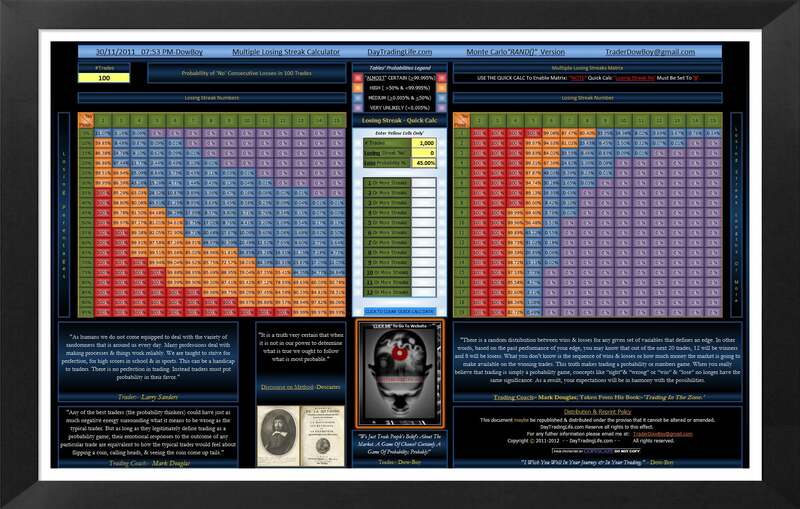 If you open the “Multiple Losing Streak Probability Calculator” you will see the right hand table is a “Multiple” Losing Streak Matrix. Set trades to 100 in the quick calc. Then you MUST enter your Loss % probability. If you trade with a 60% accuracy(win rate), enter 40% (Loss Probability). It will return all the stats from 2-15 consecutive losses within a 100 trade sample run & with the stipulated 40% losing Probability. I hope this helps you John. thank you very much taking your time for an answer! With the example you provided, how can i calculate the probability of 3 consecutive losses, 3 consecutive times in 100 trades? This was actually my original question, probably not very clear stated. You need to know what your losing % is in order to get the correct data. That’s your answer if; your average trading win % is 60% within a 100 trade sample run. If your trade run is 100 trades & your trading style is giving you on average a 40% losing; IE (60% win rate) there is a 77.34% chance you will have a losing streak of 3 consecutive trades 3 (or more) times within this 100 trade sample size. Play with the calc John, you’ll “get It” in the end. Ok, so i read i have a 77.34% chance to have 3 or more times streaks of 3 or longer over 100 trials/trades. However those 3 streaks could be all over the place, not necesarilly following one each other. Do you understand now what i mean? I just wanted to find a way how i can aproximate the case when in 100 trials with losing probab of 40% , i will encounter at least 3 times consecutive, a streak of 3 or longer loss….. Thanks, i hope i dont give you to much headache..
So,, you mention now 3 consecutive losses FOLLOWING each other. John; this is now a consecutive losing streak of 9 (Or More)!! 3 losses in a row, following one another John = 9 consecutive losses. I hope this wraps this up John. I hope you are enjoying using the calculators though. is possible talk to you about somethings? thanks for reading my blog also! dowboy you just gave a great boost of confidence on my trading strategy thank very much.. Losing is a part of winning. There is never total black, or white in trading or life. To win in trading also means to accept losing as a part of winning. Question is, within your strategy, defining your max levels of loss so you still are a NETT winner!